This holiday craft is easy and fun to make. And, it's economical! I bought a metal ring and some green and red ribbon, from the dollar store, with 2 packages of green and red peppermint candies. I tied the ribbon around the candies and then tied them onto the ring. (You can also shape an old metal coat hanger for the wreath base.) I cut the pieces of ribbon about 5” long. 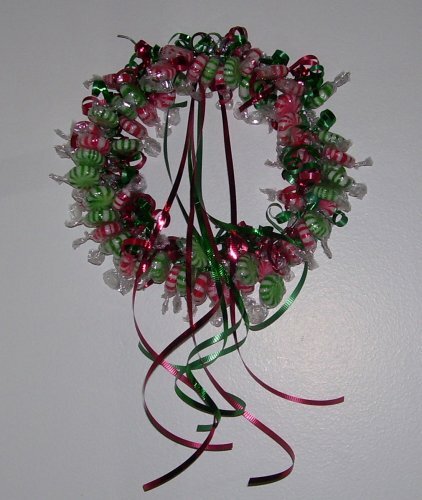 My sister-in-law used to make this decoration on a Styrofoam wreath form and attach the candies with a pin. The pin idea sounded a little dangerous for me with all the children I have at the house on Christmas day. The extra ribbon also looks nice as it hangs down and around the pieces of candy. Copyright © 2010 by Nancy Cardinal. All rights reserved.